Amazing brand new in box constance 24 cm in gris mouette (medium grey) epsom leather and palladium hardware. Plastic on hardware. Shoulder drop 9.5/18. Comes with dustcover, booklet, box, ribbon and shopping bag. Chanel rare mini gold frame 80s evening bag. Shoulder drop 21". Comes with hologram, id card and original box. 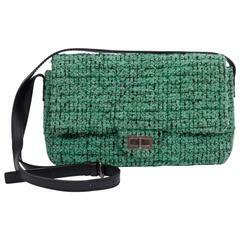 Chanel cross-body single-flap bag in green tweed with black leather detail. Shoulder drop, 19"L; adjustable. Collection 2009/2010. Comes with hologram, id card and dust cover.